Steve is an Orthodox deacon and a freelance editor, writer & researcher. Val is an accountant at the South African Medical Association (SAMA). Bridget is an ikonographer living in Athens. These include articles on C.S. Lewis's novels and South African liberation, the relation between Christianity and paganism, and links to other literary sites. Liberals and other anti-apartheid activists were often harassed and persecuted by the police and other government agencies. These pages have some political memoirs and reminiscences. You can also see our link page to pages on this or other sites. 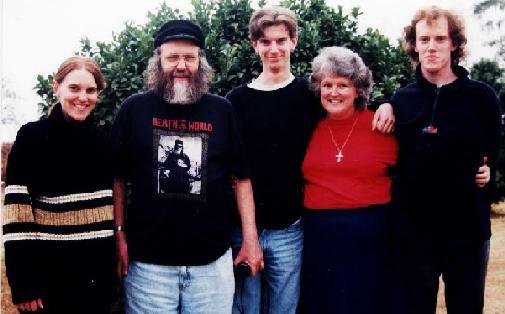 Bridget, Steve, Jethro, Val, and Simon Hayes. On these pages you will find articles about some of the things we are interested in, and links to similar things on other pages. Our interests include art, literature, Christian theology, history, genealogy and a lot more. There are more than 30 pages here, and we keep adding more, so we hope you will come back again. If you get lost, you can always come back to this home page, or there are index pages that show all our pages in various categories. The main point of having a Web page is to provide a contact and reference point for friends and family or people with similar interests (who are potential friends), so if anything on these pages interests you, please let us know by writing to us. We've lived in or near Pretoria, South Africa, since 1983, but before that we were in KwaZulu/Natal, and we were all born there, and so regard that as home. Steve retired from the Editorial Department of the University of South Africa at the end of September 1999, and ekes out the rather small pension by freelance editing, writing, teaching and researching. These pages were hosted on Bravenet at hayesfam.bravehost.com, but in September 2012 they were marked as "expired", so it seems that Bravenet, like Geocities, is defunct. We are now transferring them to this site, but that will take some time, and while the transfer is taking place some links may not work. Please be patient! Stephen Hayes is co-author and editor of African initiatives in healing ministry , on four Christian healing ministries in Zimbabwe. He is working with Prof John de Gruchy on a history of the charismatic renewal movement in South Africa. He serves as a deacon on alternate Sundays at St Nicholas of Japan Orthodox Church in Brixton, Johannesburg, and in a house church in Mamelodi, Tshwane. Jethro completed his training as a vehicle mechanic with the Tshwane Municipality, and in June 2003 started work with a truck distrbuting firm. At the beginning of 2004 he began working with a Toyota distributor in Brooklyn, Pretoria, and now works for Lexus, thus fulfilling an ambition he has had since he was 9 years old. Simon graduated with both a degree (BTech) and Diploma in fine arts in April 2003. He continues to work at Exclus1ve Books in Menlyn, Pretoria. He spends most of his time on computer animation. Bridget has a Masters degree in liturgical theology at Athens University, and is working on a doctorate. Her bursary expired, and so she now supports herself by paining ikons. Steve has been writing a few pages of political memoirs. There seemed to be very little information on the web about the role of the Liberal Party in the anti-apartheid struggle in South Africa, and so until someone writes a more comprehensive account, here is some information. There is also a little on the church struggle in Namibia. Not much yet, but I'll be adding to it, and I hope others who were involved in these events will contribute. We've added some new pages. Simon has put some of his art on display, and Steve has added a couple of pages of the past, as memoirs of a sort. There is the trolley bus page, when he was a bus driver in Johannesburg, and a reproduction of part of the Last Pink Press -- the newsletter Steve and Dave de Beer sent out when they were deported from Namibia in 1972. This one is better than the original, though, as it is illustrated with photographs.